Die Hard. 20th Century Fox 1988. I feel like I know so much about this film/franchise, but as I sit down to write, I realize I know hardly anything. I think this is the one with Alan Rickman as the bad guy, there’s a big logical flaw with the bad guys’ plot, and Bruce Willis’s catchphrase is R-rated. I’ve been told this is a Christmas tradition for some people. Even if it does go down at an office Christmas party, the connection seems tenuous. On the other hand, it’s a better connection than Hoosiers has, and I know certain TV stations would leave that one on loop over Christmas so they could go see their families. Some surprises even before I begin: I didn’t realize it was this old (I thought it was early-to-mid 90s), and Willis is doing action and not shaving his head. He looks like Nicholas Cage like that. New York police officer John McClane stops by his semi-estranged wife’s California office Christmas party as he comes to spend the holiday with his kids. It seems he’s not happy with his wife’s decision to move across the country to pursue her career without him. She’s even going by her maiden name, but for professional reasons. Then a group of German terrorists bank robbers burst in and hold the employees hostage while they break into the safe. 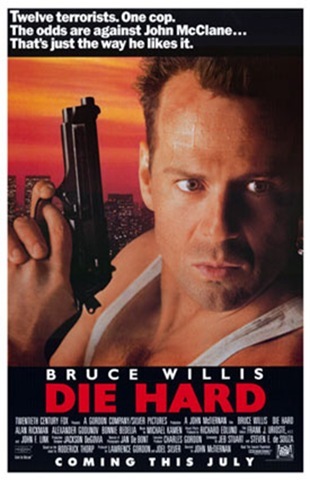 McClane is separate from the group and stages a one-man resistance against the threat, held back by the Germans’ leader Hans Gruber’s cunning, the LAPD chief’s ineptitude, and his own lack of equipment (including shoes). Bruce Willis’s McClane is a little softer than the usual generic action hero I expected. I was surprised by how much time he spends feeling his powerlessness. His personal struggles with his wife were also refreshingly complex and developed. Alan Rickman was well, as good as ever. Though I didn’t buy his German accent for a good third of the movie (the first third, except for his initial few scenes). Also Reginald VelJohnson plays McClane’s ally on the outside, yet another sympathetic buddy cop, a type he plays more often than Michelle Rodriguez plays the tough guy action girl. One thing that the action movies that stand the test of time have in common is they’re deeper than “stuff blowing up and necks snapping for two hours and change.” As I noted above, McClane’s relationship with his wife is keenly felt. The film spends almost 20 minutes getting this across before any shots are fired. I can definitely see the Christmas setting permeating the film, but it could easily happen any other time of year. The story is strong, and the drama is more thrilling than the spectacle. Altogether, an enjoyable viewing in any season. Watch this movie: with popcorn and a comfy seat. Don’t watch this movie: cheering for blood.